After months of testing and development inside the Westgate Hotel and Casino, employees from Patriot 1 Technologies were busy Tuesday demonstrating several products aimed at helping police and security identify potential threats. The line of PatScan technology includes different sensors and hardware that helps identify weapons without the intrusion of typical metal detector technology. "This is about letting people go about their business. They don't want to feel like they are walking into a fortress," Patriot 1 Technologies CEO Martin Cronin said. An employee demonstrating the PatScan CMR showed 13 Action News cameras how quickly the computer algorithms and microwave technology identified a handgun in a person's waistband. "It is not just looking for the metal in your watch. It is not tripping on an amount of metal. It is looking for a unique of a gun," Juneau said. "Your keys, your phone all those everyday items are not going to cause an alert. You don't have to pull them out of your pocket." The company says while the system is constantly scanning it is not looking for anything other than a gun and with computer algorithms doing the threat assessment human prejudices are eliminated. "The great benefit of using algorithms is they are not interested in the body. They are not looking at race, gender, ethnicity. They are looking for the presence of a weapon," Cronin said. The CMR which was the first tested at the Westgate is just one of the scanners in the system. "We are looking to push the perimeter out as far as possible to get early detection," Adam said. The PatScanTMS uses a passive scanner to detect larger weapons that are typically used in mass attacks. The TMS has a longer range and was shown hidden in ad boxes and other items inside the hotel. "It is a covert system so the individuals walking through don't even know they are walking through the system in the first place," Adam said. "Whether they are carrying it [a gun] under a coat, on their person in a bag or in luggage, as they are passing through our system it is going to capture that moment." Other pieces of the system are designed to distinguish between normal liquids and explosive liquids and gels hidden in a bottle and other objects. 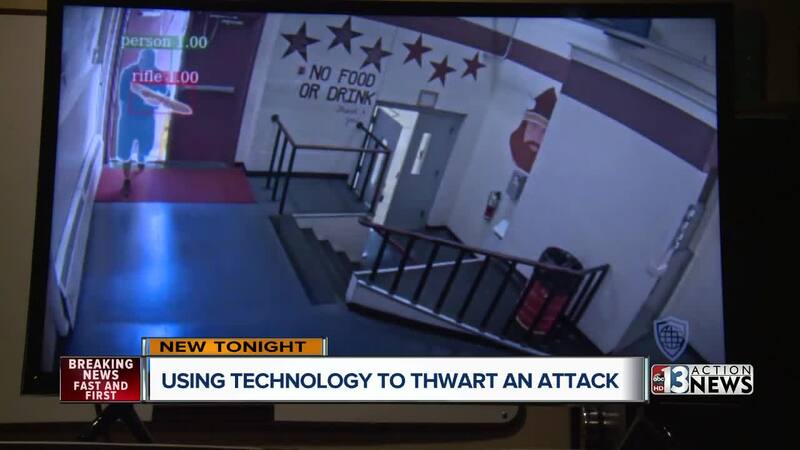 Another program works with existing security cameras to detect people approaching a building with a weapon already drawn. Developers say the notifications that system sends to security can provide the valuable minutes or even just seconds that can prevent an attack. The final piece of the system is the dashboard product that can connect first responders with vulnerable businesses or buildings to notify each other of potential threats. A developer explaining how the system protects schools utilizing the technology, "If any 911 call, fire police, happens within that circle, the staff at that facility are immediately notified so they can make decisions as soon as the caller is dialing 911." The company is still working to develop and test some of the product further but says they expect parts of the system to be ready for sales in the 4th quarter of this year.